Weddings are joyful, romantic celebrations spanning generations and memories, upholding families, traditions and declaring a love story. Nothing embodies this more eloquently than the wedding flowers which have a language all of their own. 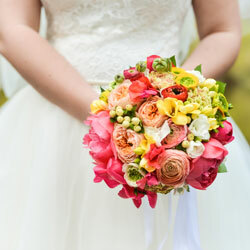 How do you find the right flowers to write your own personal wedding story? Flowers can add other meanings too. Heather in the bridal bouquet may be a nod to the groom’s Scottish heritage. The use of birth-month blooms may refer to your birthdays and there may be specific flowers that bookmark significant moments in your relationship. For example, he bought you red tulips when you had the ‘flu and that was his first affectionate gesture. Or it may be a particular perfume. In some way, weave your personal love stories together in the wedding floral arrangements. Flowers also boost the mood of your guests, create inspiring decor, refresh memories and provide a sense of warmth, love and welcome. Ensure your florist knows the theme and tone of what you are trying to create on your wedding day. From the bride’s bouquet to table centerpieces, buttonholes, posies and smaller arrangements, each declares the bride and groom’s love story and boosts the mood of the occasion.